It seems like I brought the heat from Asia with me to Austin when I returned from Singapore earlier this month. Up until then, it felt like we were in the middle of the monsoon season with rains and flash flooding hitting Austin. A lot of people complained and begged for the normal Texas summer. Now it's here. It's been here for the last few weeks and it's as hot as ever. The heat combined with the extra pounds that I gained eating ramen every single day (sometimes even twice a day) made my appetite drop a bit. Starting this week I want to start eating more healthfully and to work out more so I can get rid of those extra pounds. Although I'm really good at finding excuses when it comes to working out, this time I mean it. Things like it’s too hot, Popsi injured her hind leg and I don't have running buddy, or I need to cook more aren't going to cut it anymore. I decided to start with eating healthier. I still eat a lot of cheese and fatty meats which don't exactly qualify as healthy, but I'm doing my best. Fortunately corn is in season which means that it can be found at any grocery store for really cheap. It is one of the most versatile and hard to mess up vegetables. It doesn't matter if you boil it, grill it or fry it, the flavor is going to be consistently good no matter what. Grilled corn is one of my favorite things to eat during the summer. My family in Romania boils corn which I almost never do anymore. It's not because I don't like it that way, but mostly because it takes too long. As a kid my favorite way of eating corn on the cob was by brushing it with butter, seasoning it with salt, wrapping it in aluminum foil and tossing it in the fire for about 10-15 minutes. We'd do the same with potatoes every time we made a camp fire. It's very simple, yet so delicious especially when served with butter. The inspiration for this salad came when Roni introduced me to a Tacodeli salad bowl. I think she was dieting or something because we almost never order salad at Tacodeli. The sweetness of the corn goes extremely well with the saltiness of the bacon, while the texture of the avocado contrasts nicely with the crunchy pumpkin seeds and the crispy bacon. It's heavenly! I decide to grill a pork chop to add some extra protein to my salad. I need that, otherwise I get hungry half an hour after eating it. It is a very lean cut, so make sure you don't overcook it. It's usually best at 145F (63C) inside temperature, but I take it off the grill at around 140-142F (60C) and then wrap it in aluminum foil for about 10 minutes. The meat will continue cooking for a bit even after you removed it from the grill which will make the chop to reach 145F. Cheers! Preheat grill to 450F (230C) degrees. Pull the outer husks down the ear to the base. Strip away the silk from each ear of corn by hand. Lightly brush corn with oil. Pat the pork chop dry. Sprinkle with salt and pepper on both sides and let it rest for 5-10 minutes. Meanwhile, in a large cold skillet, lay bacon strips without overlapping them. In order for your bacon to become crisp don't overcrowd the pan and start with a cold skillet. Heat skillet over medium-low heat and cook bacon slowly. When it starts to buckle and curl, about 5 minutes, flip it to the other side. Keep flipping until you reach the crispiness level of your desire. Transfer bacon from the skillet to a wire rack or a paper towel lined plate. Save about 1-2 tablespoons of fat for the dressing. Once the bacon is cooled off, chop it roughly into bite-sized pieces. Crank up the heat under the skillet to medium-high. If you have too much grease left in the skillet, spoon out as much as you'd like, but leave about 1-2 tablespoons. Once it starts shimmering add the chilis. Cook for about 5 minutes, then reduce the heat to medium and add shallots. Cook, stirring occasionally until the shallots are soft and brown, about 10 minutes. Remove from the heat and scoop the shallot and chili mix into a food processor. Add yogurt, avocado, bacon fat, lemon juice, salt and pepper. Pulse until dressing becomes smooth and glossy. Let it rest in the refrigerator until you take care of the rest. Place corn and pork chop on the grill. Grill until corn starts to pop, about 5 minutes. Continue cooking and turning until all sides are slightly charred. The pork chop will need about 10-12 minutes on the first side. Flip over to the other side and cook for 6-7 more minutes or until the thermometer reads 140-145F (60-62C). Once the pork chop is ready, remove from the grill and wrap it in aluminum foil. Let it rest for 10 minutes before carving it. Remove the corn as well and let it cool until you can handle it. Cut the kernels from the cobs and add them to a large bowl. Add spinach, pumpkin seeds, bacon and pickled onions. Add a tablespoon of avocado dressing and toss until well mixed. Place salad on a plate, add avocado slices, pork chops slices and more dressing on the side. Sprinkle with coarse sea salt and fresh cracked pepper. Enjoy! If you like bacon really crispy I recommend you use a wire rack. It's a restaurant secret. When measuring the temperature use the thermometer where the meat is the thickest. Even though it's Memorial Day weekend, Roni and I decided to stay at home, relax, catch up on our passion projects and ultimately save some money. It all worked out great, except for the relaxation part. It feels like it's been one of my busiest weekends lately and without realizing it time flew by and it's Monday already. It's crazy how fast long weekends seem to pass. The good news is that long weekends are followed by short work weeks, so at least we've got that going for us. It's been raining nonstop here in Austin lately. I can't remember the last rain-free day. I have never experienced something like this in the four years that I spent in this town. It's as if monsoon season made its way across the Pacific and into the Gulf of Mexico. I know it's beneficial for the lakes around town, but I'm tired of waking up to thunder shaking our house in the middle of the night. I’m especially sick of the swarms of mosquitoes that eat you alive as soon as you step foot outside. I can't wait for the sunny days when we can go to Barton Springs (which by the way is currently flooded). I want to lay in the sun and take a plunge in the cold water afterwords. I want to get a nice tan, play soccer in Zilker Park, and to be finally able to play fetch with Popsi in the backyard without having to hose the mud off of her. That is the spirit I cooked this soup in- the hot days of summer when all you crave is a cold and refreshing meal. This soup recipe may be my most simple one. It requires just a little bit of effort: chop the ingredients, let them marinate in the refrigerator and lastly puree them to a silky smooth consistency. Cold vegetable soups are not too common in Eastern Europe. In Hungary we have cold summer soups, but usually they are made out of fruit. The sour cherry cream soup is one of my favorites and I plan on sharing the recipe sometime soon. As far as gazpacho is concerned, I didn't know too much about it until about 5 years ago when I was visiting a good friend of mine in Barcelona. It was an eye opening experience. “How have I never thought to make this before? ", I thought to myself. It was so delicious that I ate it every single day that I spent there and every time I return to Barcelona I begin my trip with a cold bowl of gazpacho. The idea of this soup came to me when Roni and I were having friends over for dinner. I made Beef Bourguignon as the entrée, so I wanted a very light appetizer. My Romanian heritage makes me almost always choose soups over salads, so I decided to go with this gazpacho as an appetizer. I served it with pickled shrimp (recipe to come soon), but if you're vegetarian, skip the shrimp and serve it with roasted sunflower seeds and smoked paprika. The nuttiness and crunchiness of the seeds will bring out the sweet taste and smooth texture of the gazpacho. The recipe is easily modifiable to accommodate vegans, too. Just skip the yogurt and you've got yourself a vegan delight! The final result will taste as good as the original recipe, but it won't be as creamy. Enjoy! In a large bowl combine cucumbers, avocado, jalapeño, basil, lemon juice, honey, vinegar, yogurt, olive oil, salt and pepper. Mix well until cucumbers are evenly coated. Cover with plastic wrap and let it rest in the refrigerator for at least an hour. Transfer mix to a food processor and puree until it becomes smooth. Add water and pulse for an extra minute. Taste and adjust seasoning. 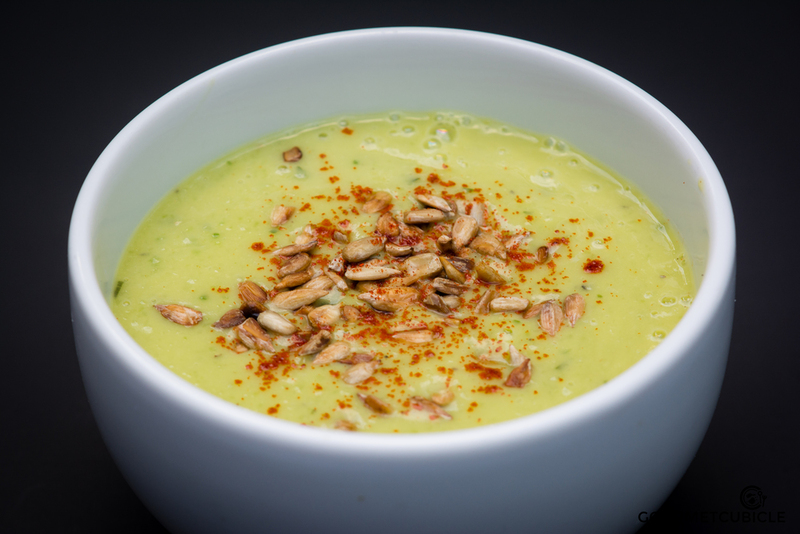 Serve gazpacho cold with smoked paprika and roasted sunflower seeds on top.